The Spaceman 6245AH – Pressurized, Mid Capacity, Twin Twist Counter Top Soft Serve Machine is Ideal for Ice Cream, Custard, Frozen Yogurt, Gelato, and Sorbet! 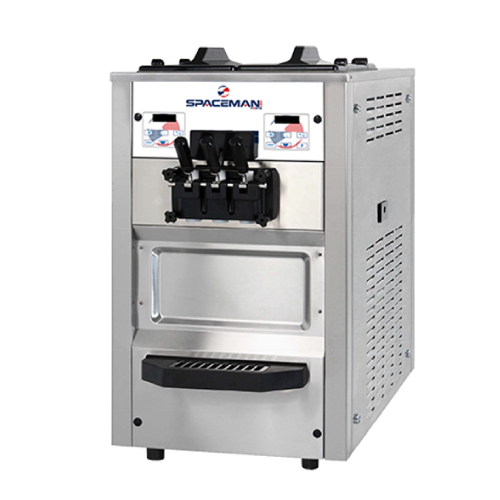 The Spaceman 6245AH is the premium soft serve option for mid to high capacity ice cream operations who want to offer more options on their dessert menu. Dual controls and compressors offer ease of mind and allow the operator to independently manage settings for two different flavors, plus swirl in the middle. Sitting conveniently on the counter top, it has a 220V connection and user-friendly digital control board. The air pump has eight different consistency settings to create creamy, fluffy ice cream good for tall cones or dipped cones, while cutting back on product cost and daily maintenance. The hopper agitator will stir product throughout the day, saving operator time and ensuring an even cool in the hopper. Patented freezing technology on the 1.8qt cylinder means a super fast recovery time, producing up to 66qts/hr, or more than 520 small cones every hour. Separate Hopper refrigeration maintains mix temperature below 4.4°C (40°F) during Cool and Standby modes. Maintains product temperature in the mix hoppers and freezing cylinders below 4.4°C (40°F) during long no-use periods.